It's Bloom Day, hosted monthly by the lovely Carol at May Dreams Gardens. Despite today's wind and rain, this has been a superbly warm and mostly dry month in Portland and the PNW, so there's lots in bloom to show. First up, it's native Mahonia time at Longview Ranch. After teasing us with tight buds for several months, Mahonia nervosa repens is opening in full glorious yellow. The wall of Mahonia aquifolium follows suite. Already blooming last month, Vaccinium ovatum is now providing welcome food for local pollinators. Loropetalum chinense 'Sizzling Pink', with a NOID Hellebore. A Rosemary I planted to disguise a stop sign pole is covered with bloom. A small Ribes sanguineum added last fall is surprising us by showing two blossoms. There's no keeping these natives down. I have to laugh: every year after they bloom, I dig out these daffodils that are in the wrong spot. And every year in spring, they show me who's in charge by coming back stronger than ever. Even the Arbequina Olive is getting into the early act by starting to form tiny flower buds already. The first species tulip to open, Tulipa hageri x aucheriana 'Little Princess'. I'll leave you with Camellia 'April Kiss', still blooming prolifically on this wet and windy March Bloom Day. Check out the link to May Dreams Gardens at the top of the post for more March beauties. This past Sunday, I had the pleasure of joining a group of local garden bloggers for a tour (and shopping!) at the Little Prince of Oregon Nursery in Aurora, OR. If you live in Washington, Oregon or California, you have probably seen Little Prince plants at your local garden shop: their distinctive tags carry a cute frog wearing a crown, and they contain excellent use and culture information. 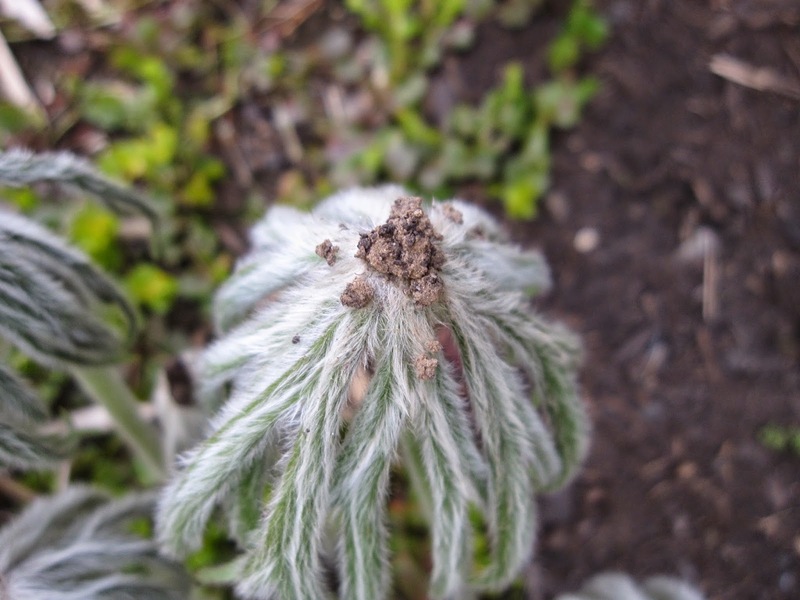 There are multiple plant lines, like Made in the Shade, Water Misers, Ground Control, etc., each targeted for a specific growing condition. Our genial host, Mark Leichty, had prepared some welcome refreshments. Mark gave us a short overview, then set us loose on the 160,00 square feet(!) of greenhouses. First up was one brimming with Tillandsias. From little to big, and silver to red, they were all here. Ever wonder how growers mass small Tillandsias for care? Just poke them through a metal grid, it appears. They display nicely like that, but the bottom line is they're probably much easier to water and manage. Apparently you can just lay the big ones on a shelf. Not only did I not get a picture of one of the huge silver Tillandsia xerographica, but I forgot to go back and get one for myself at the end of the tour. Bad plant shopper! 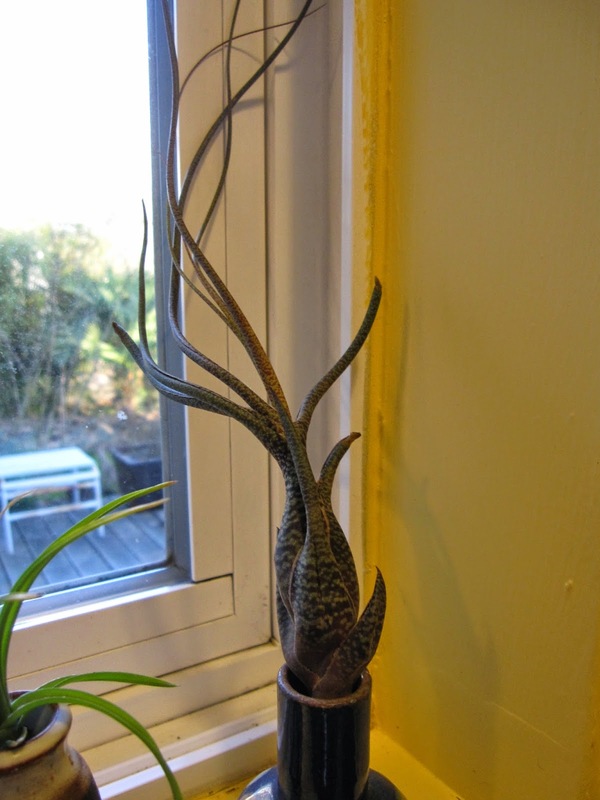 But here's one of two unusual Tillandsia butzii that did make it into my box. 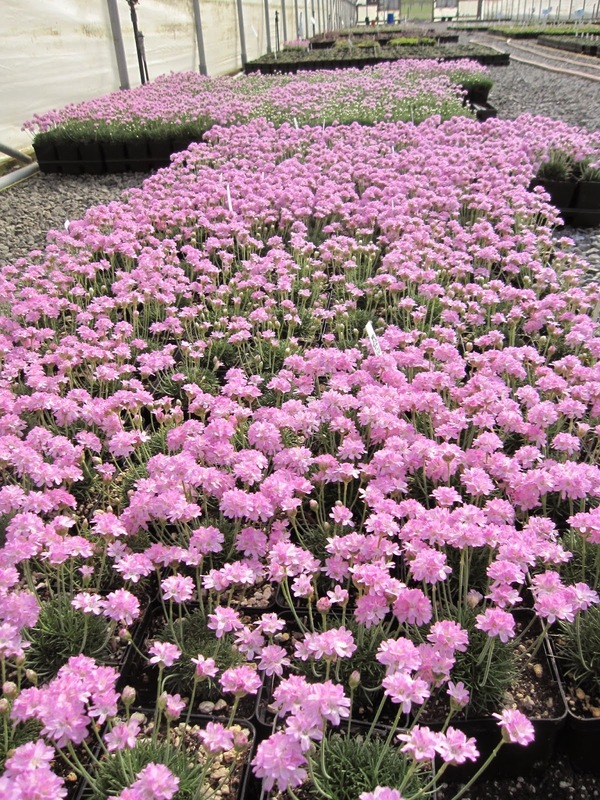 In the big greenhouses, there was something mesmerizing about the long swaths of the same plant: here Armeria maritima, I believe. Here's almost a lawn of Acorus graminius 'Ogon'. 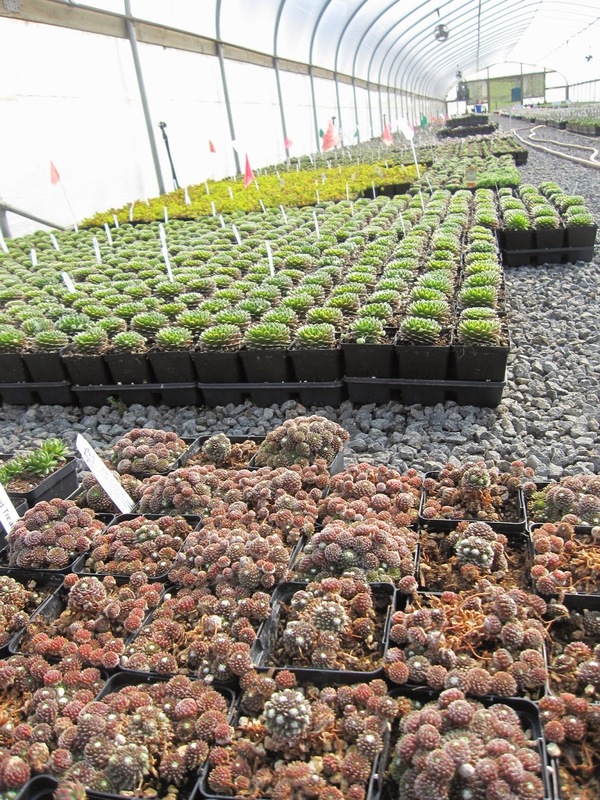 Prior to the tour, I was most familiar with Little Prince's succulent lines, and the big flats of mixed sedums in one greenhouse were a gorgeous sight. Can you imagine the succulent pots you could create with all of these? I have always admired Dymondia margaetae on visits to Southern California. It gets used as a ground cover and even as a lawn substitute because it tolerates moderate foot traffic. Narrow leaves roll to display silvery backs, and the yellow daisy-like flowers are a bonus. The tag said semi-evergreen to Zone 7, so I scooped up three plants to try at Longview Ranch. Then I discovered the Agave and Yucca greenhouse. Oh my goodness! Below, Yucca gloriosa 'Variegata', correction: Yucca dismetiana 'Blue Boy', with rosy coloring from the cooler weather. I brought home one with beautiful dark red tones - and apparently the wrong tag. A small army of Agave parryi ssp. huachucensis waiting to delight west coast gardeners. Apparently this group is Yucca gloriosa 'Variegata'. A little different from 'Blue Boy', huh? I was definitely in my happy place. A few of my blogger cohorts gathered with their chosen plants: From left to right, Tamara Paulat of Chickadee Gardens, Heather Tucker of Just a Girl with a Hammer, Amy Campion of The World's Best Garden Blog, Jenni Dennis of The Rainy Day Gardener, Laura Heldreth of Gravy Lessons, and her husband Charlie. Note Tamara and Heather sporting their sleek new Little Prince caps - it was a gorgeous day, and positively HOT in the greenhouses. Naturally, I came home with some selections from the exciting Agave greenhouse, and a few other plants, including the aforementioned Dymondia, an Erica darleyensis `Mary Helen', and a Lewisia. The big guy close to the middle is Agave 'Red Margin'. Taking a closer look at the Agaves, this one might possibly be the world's prettiest: Agave shidigera 'Shira Ito No Ohi'. Pretty name, too. The Lewisia, L. longipetala 'Little Peach' is ready to bloom, so it's already been planted out into the garden. One Little Prince of Oregon line I particularly like is Native Ground, which features plants indigenous to the Pacific Northwest. But they have a catalog of over 570 plants, so research them there (or here), then find them at retailers ranging from Fred Meyer to local nurseries and upscale plant shops. My thanks go out to Tamara Paulat for organizing our shopping trip (ahem, tour), to Mark Leichty, who took time out of his Sunday to open up for us, and to blogging buddy Ricki Grady (of Sprig to Twig), for driving us out to the Little Prince Nursery. What a fun way to spend a late winter Sunday afternoon!